It’s one thing to hear an expression and another the live it! 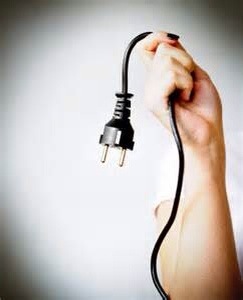 “Pulling the plug” is one of those expressions you hear, but really don’t give much thought to. Oh course other than, a toaster or an iron which you may need to pull the plug in order to put the appliance away! Well I lived “pulling the plug” first hand Saturday morning, one hour before the moving truck came to move my parents. All that kept going through my head was, the bride at the altar who just couldn’t go through with it! I thought to myself if I was about to get married and felt the way I felt all week long I would have to walk away from the altar, no matter what others thought! I just couldn’t do it… I could not separate my parents after 63 years of marriage! And yes, although they need different care, and I begged the senior living place to please reconsider putting them together they just couldn’t risk it with my moms dementia. So there I was Saturday morning all set to move them when I realized I just could not go through with the decision. So back to square one with a different perspective. And although this ride will only get more difficult, I was at peace last night knowing my mother and father were together next to each other in the their own bed! Categories: Change, Decisions, elderly, family, love, My dad | Permalink.